Edie, a second wife, didn’t have any children of her own, which was always a sadness for her. That’s why, when her step-daughter, Dominique, gave birth to a boy, Edie was over the moon. 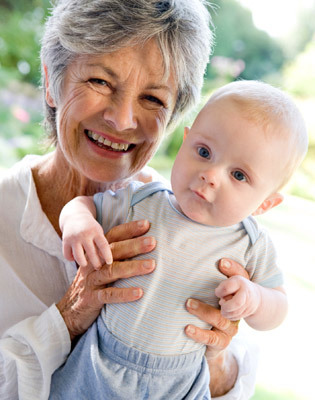 Even if she had missed out on being a mother, she thought, at least now she would have the joy of being a grandmother. Unfortunately, Dominique had always resented Edie for getting between her parents, even though they had divorced well before her father met his second wife. Now, Dominique is getting her revenge by withholding her child, making it clear that her own mother is the “real” grandmother and Edie has no role to play in the boy’s life. --Should Edie suffer in silence? --Should she confront her husband about his daughter’s behavior? --Should she insist on going to Dominique’s house when he is invited but she is not? --Should she try to enlist help from the other grandmother? Sarah: Edie should talk with Dominique directly and tell her in no uncertain terms that genetics have nothing to do with loving, and a child needs all the family he can get. Dominique should be ashamed of herself! Karen: Edie should lay out the situation for her husband, who does not get a pass here. He’s got to step up and support his wife. If he doesn’t, I fear for their marriage. James: Edie has to back off and hope that Dominique will come around—probably when she wants some free babysitting. Offering to help is definitely the way to go. Teddy: Edie has to “own” her role as grandmother. If she’s confident that, of course, she will be a full member of the extended family, I think Dominique will fold. Going to the other grandmother is the world’s worst idea. Either Dominique will feel bullied or she and her mother will close ranks against Edie.